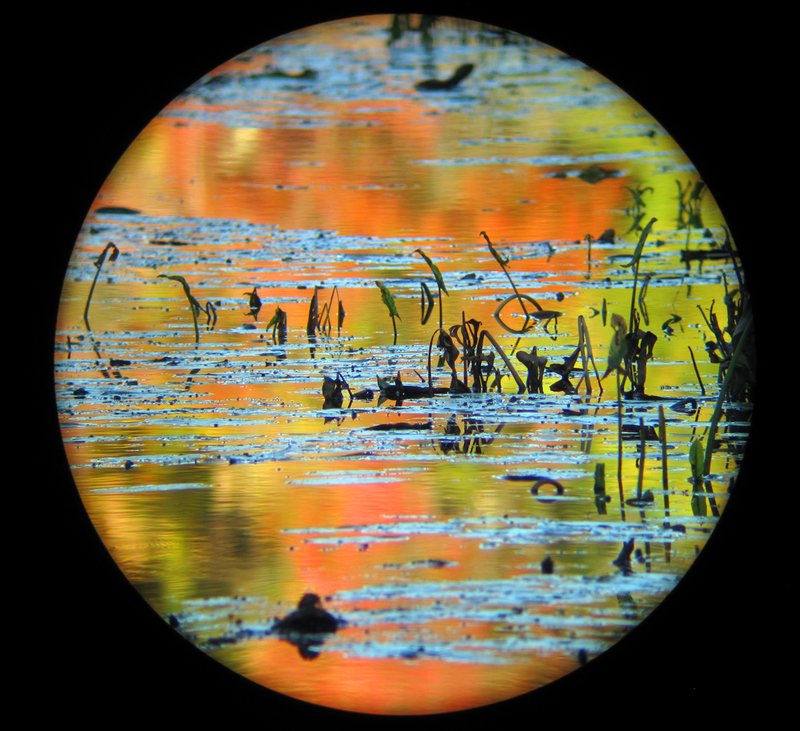 Posted on December 10, 2015 by Barry V.
After finishing my landscape painting (see Blue Skies of Autumn, part 1), I pack up and head further down the trail. 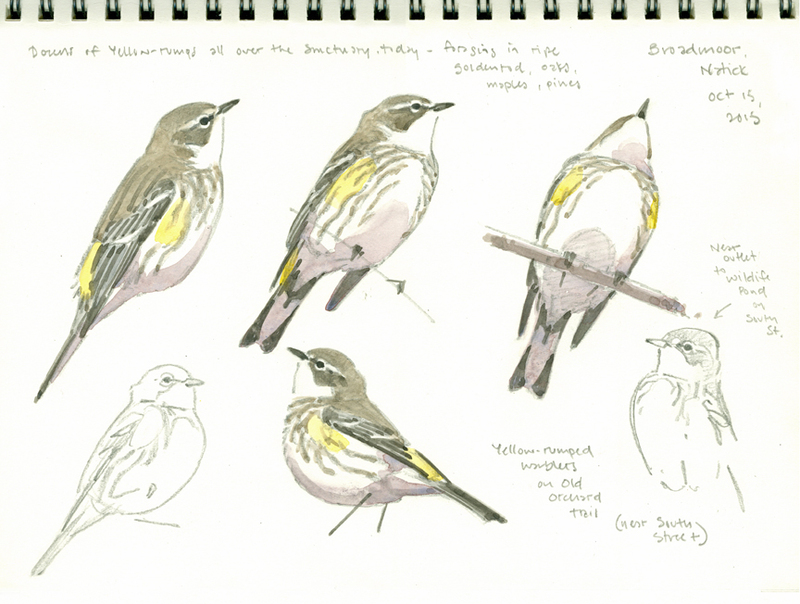 Yellow-rumped warblers are moving thru the Old Orchard in good numbers, and I fill a page with them in my sketchbook. Though they are often the most common warbler in Spring and Fall migration, I never get tired of watching and drawing these birds! Palm warblers are moving through also, in slightly smaller numbers. They have a special fondness for ripe goldenrod, and I find more than a half dozen of them foraging in the unmowed field near South Street. I get good, close looks at these birds with my scope, and have a chance to study the variations in plumage. Most birds have rich mustard-yellow overtones, but a few are quite plain and gray, and some are bright below but dull above. All of them, however, dip their tails nervously, and when flushed, flash bright white spots in the outer tail feathers. 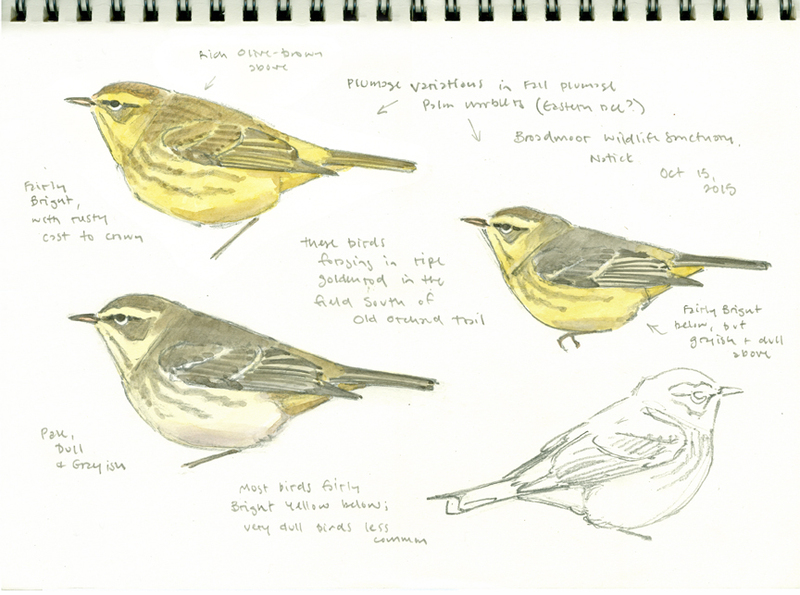 I get so involved with the palm warblers that I lose track of time. I had hoped to get out to see the Charles River on the Charles River Loop Trail, but I get only halfway there before I realize I’m seriously running out of light, and decide I don’t want to find myself on an unfamiliar trail in the dark. That evening, I enjoy a fine presentation at Broadmoor by Nils Navarro, who has recently written and illustrated a handsome book on Cuban birds. It’s always a treat to meet and share thoughts with a fellow bird painter! 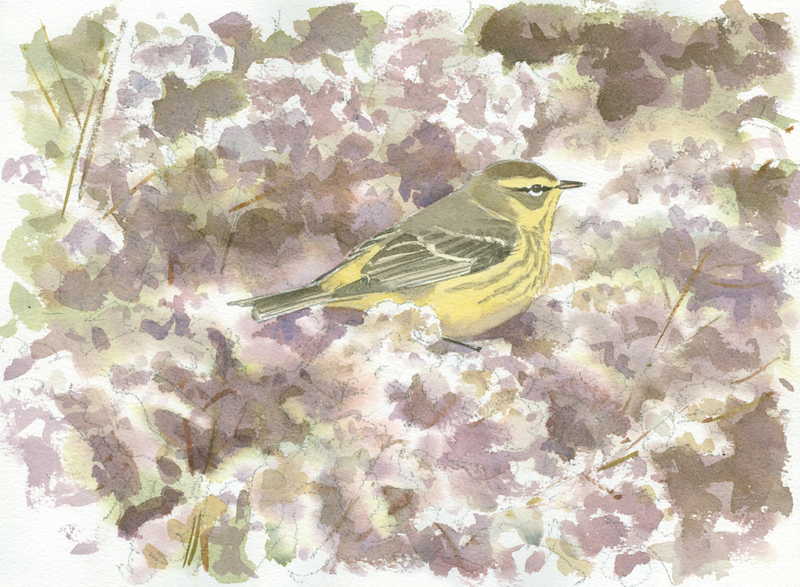 This entry was posted in News and tagged Barry Van Dusen, Birds, Broadmoor, Cuban birds, Drawing, En Plein Air, Landscape, Mass Audubon, Museum of American Bird Art, Natural History, Nils Navarro, palm warbler, sketch, Taking Flight Blog, Watercolor, yellow-rumped warbler on December 10, 2015 by Barry V..